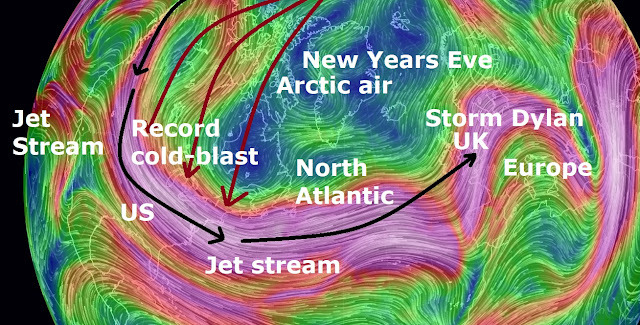 The Jet Stream is set to disrupt new year celebrations on both sides of the pond as the sixth named storm of the winter, Storm Dylan is set to batter the UK and Ireland with winds of 80mph while sucking down record cold temperatures from the Arctic with parts of the US colder than a domestic fridge-freezer! It's the Midwest and the Northeast who will witness the most severe cold with the wind-feel-factor magnifying the frigid temperatures. 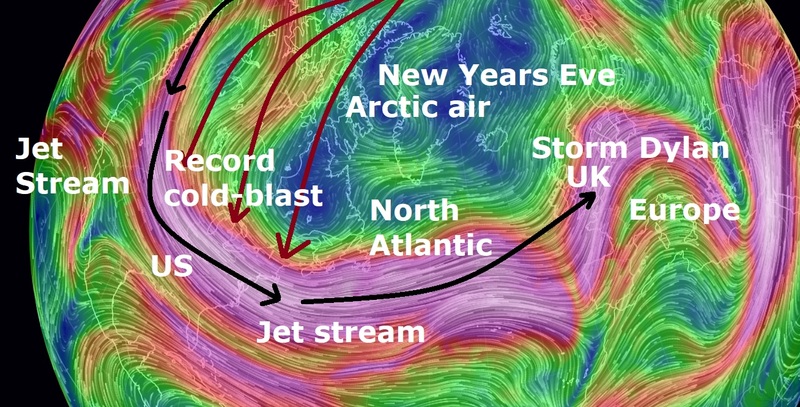 The Met Office has issued yellow warnings for gale-force winds for Ireland Scotland and Northern England for new years eve when Storm Dylan is expected to make landfall. The Met office has also warned of damage to buildings, power cuts and interruptions to mobile phone coverage. Flood warnings have been issued for large parts of the UK with large waves expected from the storm surge. 2017 appears to be going out with a bang rather than a whimper after Record snow totals were smashed as Erie, Pennsylvania received 53 inches of snow in 30 hours, this is the greatest two-day total in the entire state of Pennsylvania. Erie picked up another 24.5 inches of snow on Tuesday, bringing the two-day tally to 58.5 inches. That is the highest two-day snowfall total in the entire state of Pennsylvania, according to the National Weather Service. However, the storm, which actually began on Sunday, has dropped a grand total of 68 inches of snow, more than a metre on Erie, according to National Weather Service Cleveland. Erie County Executive Kathy Dahlkemper signed a Declaration of Disaster Emergency.